Escondido police circulated a composite sketch of a man who earlier this week beat an LA Fitness employee while attempting to sexually assault her as she was closing the business. 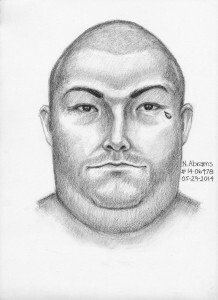 Escondido police released a composite sketch of a man they are looking for in connection to an attack on an employee at the LA Fitness gym. Photo credit: Escondido Police Department. The man hid inside a children’s play area at the business at 362 W. El Norte Parkway and waited until around 10 p.m. Tuesday to jump out and surprise the woman, according to Escondido police. The victim was taken to Palomar Medical Center, where she was treated for minor injuries, including an abrasion to her back, police said. Police described the assailant as Hispanic, around 35-45 years old, 5 feet 5 and heavyset, with a shaved head and a teardrop tattoo under his left eye. He also had a tattoo of a cross on his left ring finger, police said, adding that at the time of the attack, he was wearing a white tank top, black shorts, black high top tennis shoes and white knee high socks. Anyone with information about the man’s identity was asked to call police at (760) 839-4717. Tipsters wishing to remain anonymous can do so online at www.police.escondido.org or by calling (760) 743-8477.